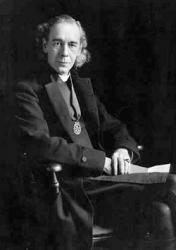 Robinson, Joseph Armitage, D.D., Dean of Westminster since 1902, of Christ College, Camb. (B.A. 1881, M.A. 1884, D.D. 1896), sometime Fellow of his College, Norrisian Prof, of Div., Camb., Rector of St. Marg., Westminster, and Canon of Westminster, &c.,is only slightly associated with hymnology. His hymn, "'Tis good, Lord, to be here" (Transfiguration), was written c. 1890. It was included in the 1904 edition of Hymns Ancient & Modern, and supplies a long-felt want with respect to hymns on the Trans¬figuration.